The McDonald Dance Academy runs a wide range of dance classes for adults from it's base in Burscough - conveniently located in the heart of the village close to free parking spaces, a railway station and bus stops. Our classes include; Ballroom (Waltz, Quickstep, Foxtrot, Tango, Viennese Waltz), Latin American (Rumba, Samba, Cha Cha Cha, Jive, Paso Doble), Classical and Modern Sequence Dances, Argentine Tango, Salsa, Ballroom & Latin American Formation Teams, Street Dance, Jitterbug and Rock 'n' Roll. We also have special classes for the more senior amongst us (U3A) and adults with learning disabilities. All of our classes are run by professional qualified instructors, assisted by student instructors who have reached the highest level of the junior medal system. All staff are vetted and there will always be a CRB cleared instructor with each class were appropriate. This is a class for absolute beginners of all ages. It is best to join at the beginning of a term, although you can start at any time. We teach all the ballroom and latin American dances. Don’t worry if you haven’t got a dance partner, we can try to find you one. The teacher helping with this class are Maureen, Lauren Nixon and Laura Morey. This is a beginner Ballroom and Latin American class including some simple sequence dances and Argentine tango. The class are beginners with a cup of tea and a biscuit in the interval. You don’t have to be a member of the U3A to join the class, if this time slot suits you better, please come along and join the group. The teacher is Maureen McDonald. This class is for dancers who can get around the dance floor with their basics in all 8 dances, (waltz, tango, quickstep, foxtrot, rumba, samba, cha cha cha, jive) and are ready to learn a little more in each dance. The teachers for this class are Maureen McDonald and Laura Morey. This class is for the intermediate social dancer. From bronze grade and above. Medals are available to take if you wish to, or just come to the classes to improve you dancing technique and variations. The teachers for this class are Maureen McDonald and Emma Park. This class is for all levels, from absolute beginner to the more confident dancer. It usually takes the beginner one, or two, terms to learn the basics and then move up in the class. The class is split in to two teaching groups, depending on ability. Medal exams are available to take in both dances if you wish to. We teach variations and technique. The teachers are Maureen McDonald and Emma Park. 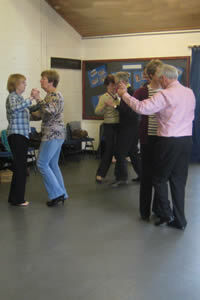 This class teaches ballroom, Latin American and Argentine Tango to adults with learning difficulties. They take medals twice a year to show improvement. The Grove has disabled access. The teachers for this class are Maureen McDonald and George McDonald. 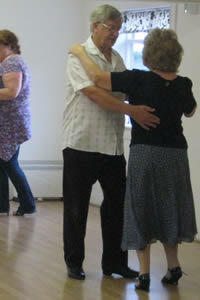 View images from our Adults with Learning Difficulties Ballroom, Latin American & Movement to Music Dance Classes.